Striped bass anglers -- Fish and Game invites you to participate in mail-in or electronic logbook reporting of your striped bass catch and effort this year. New Hampshire Fish and Game's Marine Division has conducted an annual Striped Bass Volunteer Angler Survey since 1993. Each year, volunteers of all experience levels fill out logbooks documenting information about their striped bass fishing trips in New Hampshire's coastal waters. Anglers are asked to provide catch and effort information about each trip taken, whether for just a single trip or many. 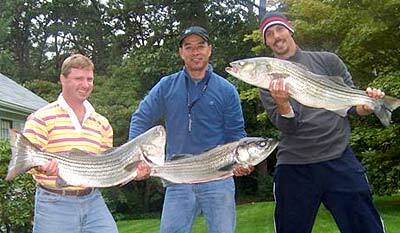 Anglers are also asked to measure the lengths of all striped bass they catch, including those fish that are released. This allows for the collection of information on striped bass of many lengths that would not be obtained through the creel surveys that Fish and Game conducts each year. All participants who submit their logs before November 30 will be entered into a drawing to win a framed Striped Bass print called "Shadow" by Victor E. Young, donated by the Coastal Conservation Association of New Hampshire, or a rod and reel donated by Kittery Trading Post. Logbooks can be completed online using the link at the top of this page, in paper format, or through use of an electronic spreadsheet. Information from the volunteer angler survey is vital to striped bass management, as the data is used by state and federal fisheries biologists to assess the status of the striped bass populations each year.